First off, that cover. Another magnificent piece by artist extraordinaire Stjepan Sejic. I’m in love. I love the black/red contrast and the setting itself too. Stjepan never disappoints, not really, and this is definitely one of the best covers that he has done. I kind of wish now that the issue had been entirely based on this composition instead of the third part of the Borne Again arc. Anyway, when this issue gets started, we are back in the hospital where Deputy Sheriff Kate Rooney is facing off against a crazy psychopath who attempted to murder Sara Pezzini back in Witchblade #170, the first chapter of the Borne Again arc. But there is a big twist involved since there is also an Angelus Warrior present, drawn perhaps to the psychopath’s use of a weapon made out of a small piece of the Witchblade. From the flashbacks in the previous issues, we know that Sara is no longer the bearer of this Artifact and so the mystery is even more intriguing than it appears. 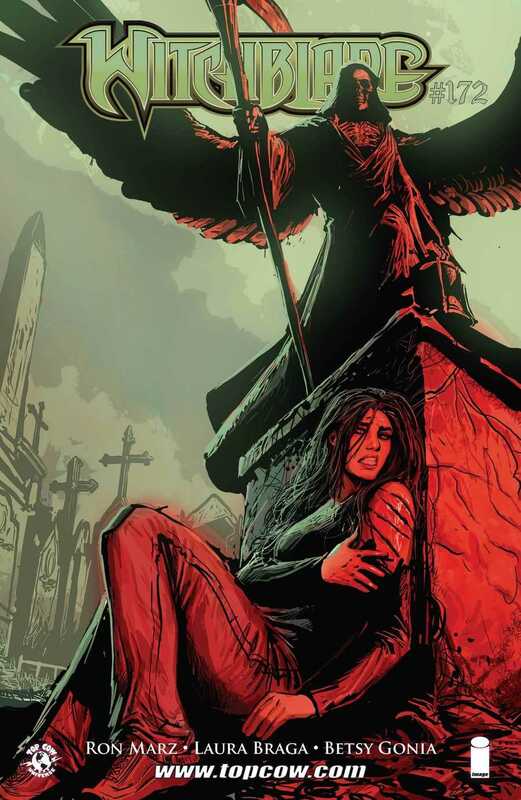 With the help of the flashbacks and the present time plot, Ron Marz fleshes out a tale of redemption, burden and betrayal that ties together Sara, the current Magdalena Patience, the Angelus and another Artefact bearer in a world where Jackie Estacado, the thebearer of the Darkness, is dead. The balance between the Angelus and the Darkness is thus upset and since the Witchblade is the cosmic offspring between the two, the very embodiment of their balance, there are struggles for power everywhere. This is at the core of what the Borne Again arc seems to be out. And I gotta say that conceptually I am loving it. Ron’s dialogue is always spot on and I loved all the action in this issue. I was hooked, pretty much from the get go, and by the time I was done reading the issue I wanted more immediately. Sadly, I have to wait another whole month. The elevation of Kate from just a Sheriff’s Deputy to a hero is a great little subplot in this issue, and yet I am thinking that there’s more to it. I have a feeling that Ron is building up to a big reveal about her and I am very excited about it. One of the nice things in this issue is that Ron provides a sort of catch-up as to what the Witchblade is for all readers. Kate has now been exposed to the Witchblade and the Angelus both, and she needs answers to several questions, which a recovering-from-bullet-wound Sara is happy to provide. On the art side, this was another stellar issue. My only problem with it was that some of the character poses were just that, poses. Sara and Kate appeared to be doing modeling poses or something in some of the panels and that all felt just completely at odds with the tone of the comic, given that this is a horror/supernatural book. So that’s that. And I’ve finally warmed up to the glossy style of the artwork, so I’m liking it a lot. I can’t wait to see more artsy goodness from Laura Braga in the next few issues of the comic. Quite a satisfying issue I have to say. Posted on January 31, 2014, in Comics Reviews, Review Central and tagged Angelus, Angelus Warrior, Artifact, Betsy Gonia, Comics, Comics Review, Crime, Horror, Laura Braga, Magdalena, Religion, Review, Review Central, Ron Marz, Sara Pezzini, Stjepan Sejic, Supernatural, Tom Judge, Top Cow, Top Cow Comics, Top Cow Productions, Top Cow Universe, Witchblade. Bookmark the permalink. 9 Comments.